It’s that time of year again when the burglaries are occurring around Loughton, Theydon Bois, Chigwell, and Buckhurst Hill at alarming rates. Entry is being gained via glass doors and double glazed windows. When the clocks go back and the nights start to draw in, Misty Glaze experience a higher volume of emergency glazier service calls, in and around these areas. The most popular point of entry is the double glazed doors. Toughened safety glass will be tampered with, causing the double glazed units to explode. The intruders usually attack the biggest area of glass, ( doors ) this leaves a big wide opening to walk in and out of the building. We have been informed at Misty Glaze that Essex police are doing all they can to combat this trend of entry gain into properties, but with such a large area being targeted, it’s a very difficult task. We have noticed that most of these burglaries in Buckhurst Hill and Chigwell are being carried out during the day. Noticed by the unfortunate home owners when they return from work to see a pile of broken smashed glass on the floor. Their home turned upside down, causing an emergency glass repair and emergency board up to be needed. 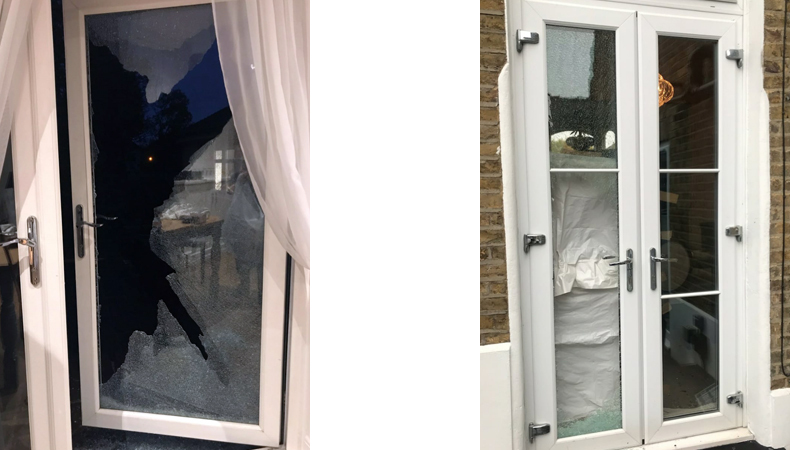 The people of Chigwell and Buckhurst Hill are dealing with a very serious spate of double glazed unit attacks and breakages and require an emergency glazing service and board up. Theydon Bois and Loughton have seen a very big increase in glass attacks this year, emergency glazing in Theydon Bois and Loughton is very common from October until February. It’s very worrying times for all of us and especially the residents of Loughton, Theydon Bois, Buckhurst Hill and Chigwell. We have experienced a rapid increase in this level of entry gain within the last 3 years. The volume seems to keep rising each year. Having a large impact on worried residents within the golden triangle of Essex. It’s very important for Neighbourhood watch teams around the golden triangle of Essex to keep a look out for each others properties and is vital to help work alongside the police to make these areas hard for the intruders to operate in. If you are unfortunate enough to be on the receiving end of the double glazed unit attack. You can be sure that Misty Glaze can help secure your home with our emergency board up service in Chigwell, Loughton, Theydon Bois and Buckhurst Hill. Emergency double glazing repairs are stress free when dealing with Misty Glaze. Once your home or business has been secured, we can return with a new double glazed unit at a later date. Providing advice on different levels of safety glass that can be upgraded to your existing windows and doors. Laminated safety glass is very tough and durable. It’s a very good glass upgrade from toughened safety and is much more difficult to break through. Held together by a plastic interlayer. We always recommend and advise clients that have fell victim to a broken window attack to call the emergency services. This will allow them to attend the property to take necessary finger prints and information to help try and catch the perpetrators. Crime reference numbers are issued and can really help when trying to deal with your insurance companies. All issued invoices from the day / evening of the emergency board up to the date of installation. Will have the crime reference number on the invoice to help with there insurance claims. Our staff are very highly trained and act in a suitable and professional manner. We understand the sensitivity required after a home burglary. We will always take away and dispose of the old broken glass, leaving the area as free from danger as possible. 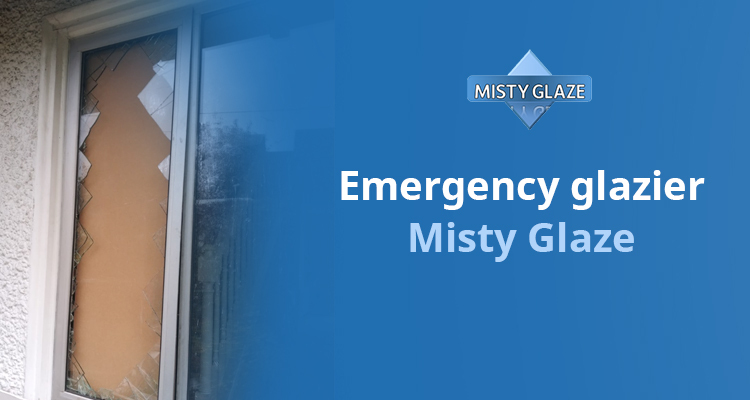 If you require emergency glazing board up in Loughton, emergency glazier in Chigwell, emergency double glazing repair in Buckhurst Hill, or emergency glass repair in Theydon Bois, call us today and Misty Glaze will be on hand to take care of your emergency glazing needs.